The camera offers integrated Wi-Fi 802.11n, and Bluetooth LE for communicating with mobile devices. Both Android and iOS apps are already available in the App Store and on Google Play for controlling the camera, managing content, and live-streaming. Like the Olympus Air, the E1 provides an I/O port, open platform and SDK for developers. The camera includes�a 2.5″ 320×240 rear LCD. MicroSD cards are used for storage, with a maximum card size of 128GB being supported.�The battery has a 2,000mAh capacity and is user removable, and Z Camera will include two batteries with the unit. Battery life varies depending on usage. Recording at 4K with Wi-Fi turned on will result in 45 minutes of recording time on a charge, while turning Wi-Fi off will increase the run time to 80 minutes. The E1 is constructed from magnesium alloy, which Z Camera says is ‘specifically designed to dissipate heat’ while supporting the image processor. Despite the camera’s�similar shape and size to popular action cams, Z Camera does not give any rugged specifications for the E1, but says a waterproof housing may be released in the future. Z Camera is launching�the project through Kickstarter where it has so far raised more than double its funding goal.�Some of the backing options have been sold out, but a $599 USD option remains for the E1 camera, as well as a $799 USD option for a bundle that includes a Panasonic 14mm F2.5 lens. Shipping to backers is estimated to start this November. The eventual retail price will be $699 USD body-only or $999 with the 14mm lens. Z Camera has both a stills gallery and a sample video�on its website. LAS VEGAS – (7/20/15) – E1 Camera, the world’s newest entry into the 4K ultra-high definition (UHD) camera market from new digital imaging startup �Z�, recently launched on Kickstarter. The E1 features a micro four-thirds (MFT) sensor and interchangeable lens system compatible with most MFT lenses, as well as one of the most advanced autofocus systems available today. �After spending years in the camera industry, I realized that most companies are much more interested in cutting costs of their current products than investing in developing new ones and listening to what people want,” said Jason Zhang, engineer and creator. Launch & Availability � �Z� is looking to raise $42,000 over the course of the company’s active 30-day Kickstarter campaign. However, the company is utilizing the crowdfunding platform more as a way to take pre-orders and introduce both the brand and the product to consumers, as well as gain valuable market insight concerning this form-factor and future features. Once the Kickstarter campaign has been completed, the E1 (body only) will retail for $699 as well as in a kit with a 14mm (f/2.5) lens for $999, however the company will be offering perks for Kickstarter backers up to 40 percent off retail pricing (in limited quantities). 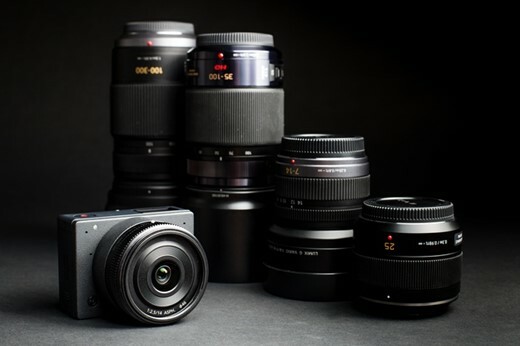 Unlike its competitors � The E1 camera features a unique interchangeable, Micro Four-Thirds lens mount, adaptable with the widest range of auto-focus (AF) lenses available from Olympus, Panasonic Lumix, Leica and Sigma, as well as a variety of existing manual-focus (MF) lenses. In lieu of bulky DSLRs, this camera will allow users to travel with their arsenal of lenses to capture the highest-quality footage possible, revolutionizing the quality of content consumers can produce and easily share. The E1 is Wi-Fi 802.11N, Bluetooth Low Energy (BLE), and Ambarella A9 image processor equipped. Easily capture cinema-quality 4K (4096×2160) video at 24 frames per second or ultra-high definition video (3840×2160) at 30 frames per second with H.264 compression. Advanced 3D noise filters using motion compensated temporal filtering (MCTF) technology reduces noise and jitter. This allows for incredible low-light performance with the camera’s ability to shoot at up to 102,400 ISO while maintaining high image quality, up to 6400 ISO. �? Connect & Control – Z’s E1 is equipped with proprietary applications for iOS and Android, already available in the Apple App Store and Google Play. These apps provide the ability to control, live stream and manage content via their Wi-Fi or Bluetooth 4.0-enabled devices. Users can leave the camera in standby mode and remotely power the E1, whether it’s powered on or off, a feature not available with most other camera models. Once powered on, users can control and trigger the camera without physical contact. Additionally, this allows for easy download of photos or videos and sharing content, direct from a mobile device. These features allow the camera to be an ideal solution for use during documentaries or live events. A videographer can mount the E1 from the ceiling prior to the event using a standard tripod mount accessory, provide a direct AC power source into the camera and avoid the need to physically access the camera in order to power it on. This is also a perfect solution for drone use so a drone pilot can remotely power the camera on only when needed without having to land the drone in order to set it up. Software Development Kit – Advanced users can customize the functionality of the E1 through the open platform, I/O port and available software development kit (SDK), available in two levels in order to add or customize functionality.